Earlier this month, I took three vacation days and drove across the state of Pennsylvania to attend the ANA convention in Philadelphia, including the meeting of the Liberty Seated Collector’s Club (LSCC). Both the convention and the meeting have been described elsewhere. At least one person commenting on the convention described those of us who attend shows on weekdays (in my case Tuesday, Wednesday and Thursday) as “diehards”. My only comment for those of you who have not done so is that, if you can find a way to manage it, attending an ANA, a FUN show, or a Baltimore Whitman show is a great experience which I always find worth the travel and the vacation time. This year two of the highlights were the LSCC meeting and the opportunity to view the Battle Born Collection. The LSCC meeting, already recapped in this newsletter, included an informal discussion of the Top 25 Liberty Seated Quarter varieties (Gobrecht Journal Issue #111) and plans to survey club members regarding the coins in their possession during 2013. This topic is, obviously, of great interest to me and as I walked into Stack’s lot viewing while still thinking about the upcoming survey I began contemplating the term “uncollectible” as it may, or may not, relate to seated quarter varieties. The Battle Born collection included two seated coins that one could consider uncollectible, the unique 1873-CC no arrows dime and the 1873-CC no arrows quarter (only five known examples). Does this idea extend to varieties? Clearly the sort of demand that pushed prices for these two coins to $1,880,000 and $470,000, respectively, does not exist for relatively esoteric quarter varieties. So are excessively rare varieties collectible? The Top 25 list was formulated so that it could be a collecting objective. Though some rare varieties are included, no varieties with fewer than 10 examples known are in the set. In fact, a number of interesting varieties made the short list of coins to be included in the Top 25, but ended up excluded precisely because they are so rare as to be “uncollectible”, or at least to make the set too difficult for many collectors to pursue. There are four such coins that I hope to include in the 2013 survey: 1854 thin date (Briggs 1-A), 1856 with flag of 5 in shield (Briggs 9-G), 1857-O with 8 in denticles (Briggs 7-C) and 1858-S with far left mintmark (unlisted in Briggs). Rather than compose an excessively long and detailed article, I will discuss and picture one coin per month in a four part series beginning this month with the 1854 thin date. At the time “The Comprehensive Encyclopedia of Liberty Seated Quarters”(Briggs, 1991) was published this variety was represented by only two known examples, the first discovered in 1988 by Harry Smith. Very few additional examples have been found since, though to be fair it is unclear how many people have actually looked for them. Counting the two mentioned by Briggs, I have been able to confirm only five distinct examples to date. Attribution of the 1854 thin date is challenging. 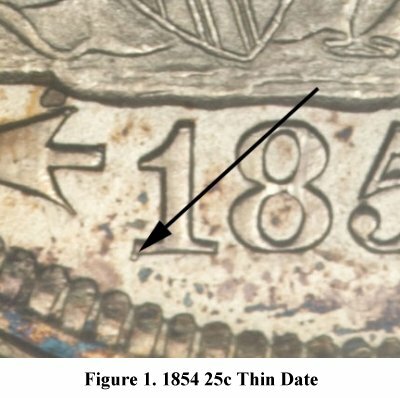 Though the date is indeed thinner than those on other obverse dies, both die states and wear of the coins themselves makes the relative “thickness” or “thinness” of the date unreliable as an attribution key. Date position is not useful either, as all known dies have approximately the same date position. 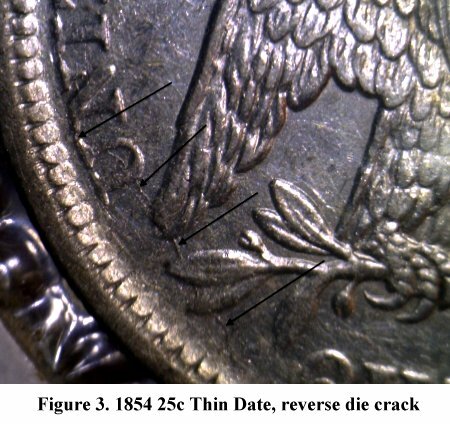 The key to attribution of the thin date obverse is the lack of a small spur hanging down from the left base of the one (See Figure 1). The date punch used to prepare the thin date obverse die is unique amongst the known date punches used for the 1854; it is the only one that does not have the spur. Using the absence of a feature for attribution is problematic for obvious reasons, but the presence of the spur shown in Figure 1 does rule out the possibility that the coin in question is the thin date. 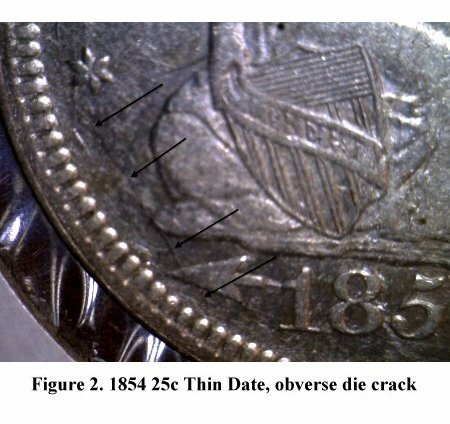 Fortunately, both obverse and reverse have notable die cracks that aid in attribution of the thin date variety. The obverse (Figure 2) has a die crack that runs through the left arrow, the left edge of the rock, and nearly to star 1. Earlier die states have the portion of the illustrated crack between the rock and star 1, with the lower portion of the crack extending through the left arrow developing in later die states. The reverse also has several die cracks and chips, with the earliest and most obvious running from the top of the “D” in UNITED along the tops of the letters and down through the tip of the left wing as shown in Figure 3. Images courtesy of Heritage and John Wragg.